2018-2019 Varsity Dream Team Details Posted Below. Description: Varsity Dream Team is an extension of CCFC’s highly successful Dream Team program designed to give opportunities for advanced players to excel in an even more rigorous educational environment. Participants will benefit from extended small group sessions with CCFC’s excellent team of master instructors, as well as special guest instructors. The training sessions will specifically prepare them for our recommended events away from the club. See schedule below. Please note that Varsity Dream Team participants are also welcome to join us for our regular Dream team practices on Fridays 4-5pm and Saturdays 10-11am. Developing strong habits for self improvement. Our small groups along with extended 90 minute classes will ensure that all topics are covered comprehensively. Practices will take place on Saturdays from 8:00-9:30am. Trips: As part of this program we have recommended and scheduled four events that will provide an enriching experience for the team and individual players. These competitions are optional. Instruction will be provided at the Stamford Open and coaches will play alongside Varsity Dream Teamers in the team events. Parents are responsible for making their own travel arrangements as well as any fees for each event. See schedule below dates and more details. Requirements: All participants must be in grades K-12 and have a minimum peak rating of 1200 in order to be eligible to register. They will also be expected to have a strong work ethic, enthusiasm for chess and learning, and act as good role models for junior players. Varsity Dream Teamers will also be asked to participate in at least one regular Dream Team match. Registration & Fees: $400, for CCFC Members. $600 Non-Members. The fee for Varsity Dream Team includes ten 90 minute specialized small group training sessions with our professional team and guest instructors, coach attendance on trips, and a personalized team jersey. Each family is responsible for covering their own travel and entry fee expenses associated with each trip. On-site coaching at the Stamford Open is included. Varsity Dream Teamers will receive an additional discount to join our instructional group at the nationals. A team tournament where Varsity Dream Teamers will be grouped with each other and coaches to form competitive teams. Two or three day tournament at the Sheraton Hotel in Stamford, CT. This tournament features longer time controls in a more serious playing environment. Coaching will be provided venue at the tournament prior to the start of the games on Saturday and Sunday mornings. A three day event in Florida. Coaching at nationals is not included in the Varsity Dream Team program, however, players will be welcome to join our CCFC group travelling to Florida at a discounted rate. A three day tournament in Parsippany, NJ. One of the largest tournaments held in US. Varsity Dream Teamers will be grouped with each other and CCFC coaches to make competitive teams. Questions? Contact us at ccfc@fairfieldcountychess.com or (203) 505-6215. 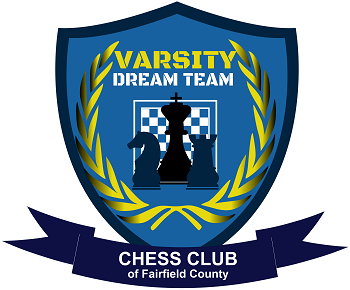 © 2018 Chess Club of Fairfield County. All Rights Reserved.